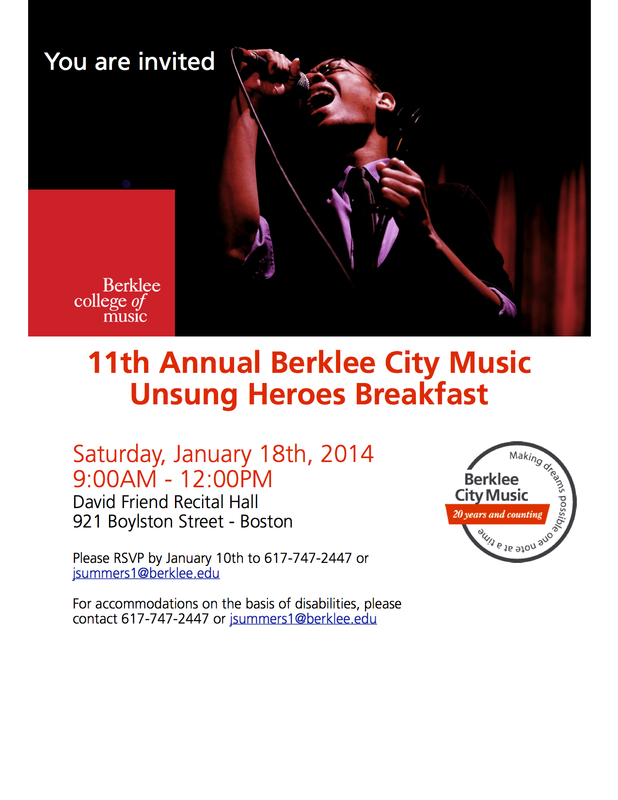 In its 11th year, the Unsung Heroes Breakfast serves as a time to welcome back our City Music students and community in the New Year with music, food, and an inspiring message. Taking place near Martin Luther King Jr. Day, this also serves as a time to appreciate those who have fought against oppression to create equality. Each year, we honor an Unsung Hero, someone who has come from an ordinary background and has gone on to do extraordinary things. This year’s Unsung Hero is Sarah-Ann Shaw. Mrs. Shaw was the first African-American female news reporter in Boston and will be honored for her work in uniting the communities of Boston through news reporting and advocacy for women’s and civil rights. Mrs. Shaw has a long history of activism in her community, starting with volunteering in her teens at political events, to reporting on special news segments that highlighted the achievements of minorities, to joining committees and boards to oversee community growth. She believes that every person can help to improve his or her community through the idea of ordinary people doing extraordinary things. I hope that from her speaking at the Unsung Heroes Breakfast, the audience will take away the same message. While her medium of action may be politics, the practices and attitude that she has can easily be applied to those whose medium is music. I had the opportunity to have lunch with Mrs. Shaw at the Haley House, one of her favorite restaurants in Roxbury. Walking back from our lunch meeting, we were stopped by a man who wanted to thank her for a report she presented on him as a little boy in the 1960s. This kind of interaction was a normal everyday occurrence for Mrs. Shaw, but I was in awe at how much of a presence she had in her community. It was an honor to speak with Mrs. Shaw, and I look forward to hearing her speak at the Unsung Heroes Breakfast this weekend. I am sure that she will inspire the audience and leave them with the motivation to improve their community.